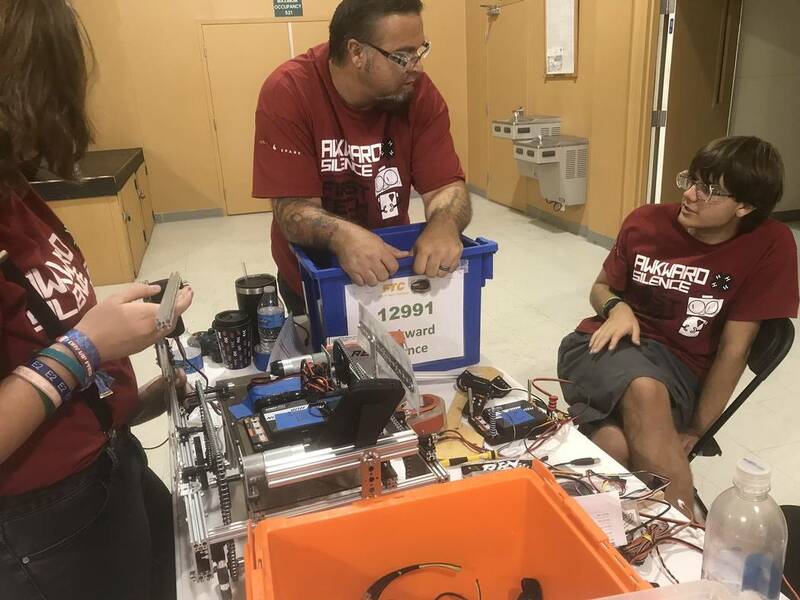 Several school-aged children from the Pahrump area will be heading to Las Vegas on Saturday to battle for first place in a statewide robotics competition. 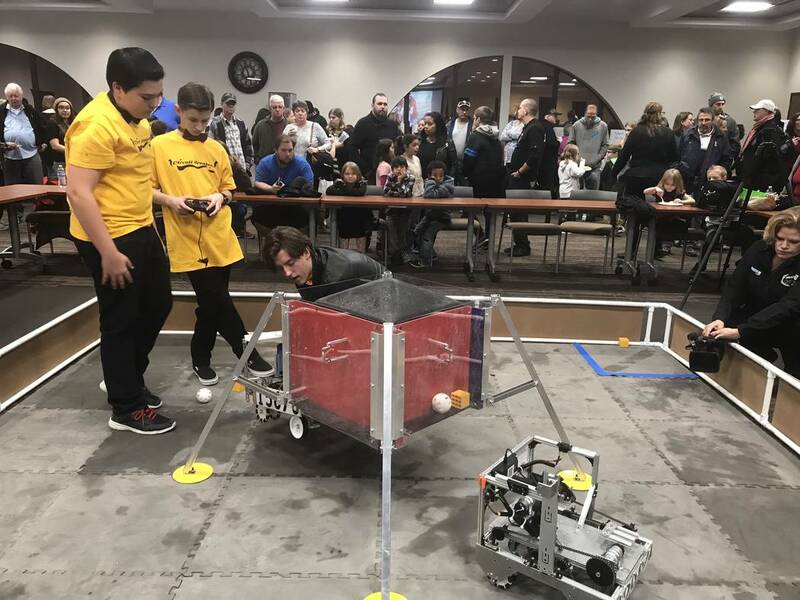 Jeffrey Meehan/Pahrump Valley Times Several robotics teams in the Pahrump area gathered for a fundraising event at Valley Electric Association's conference center in January to raise funds and show off what they've been working on. Three teams from the Pahrump area are heading to the Nevada state championships on Saturday in Las Vegas. 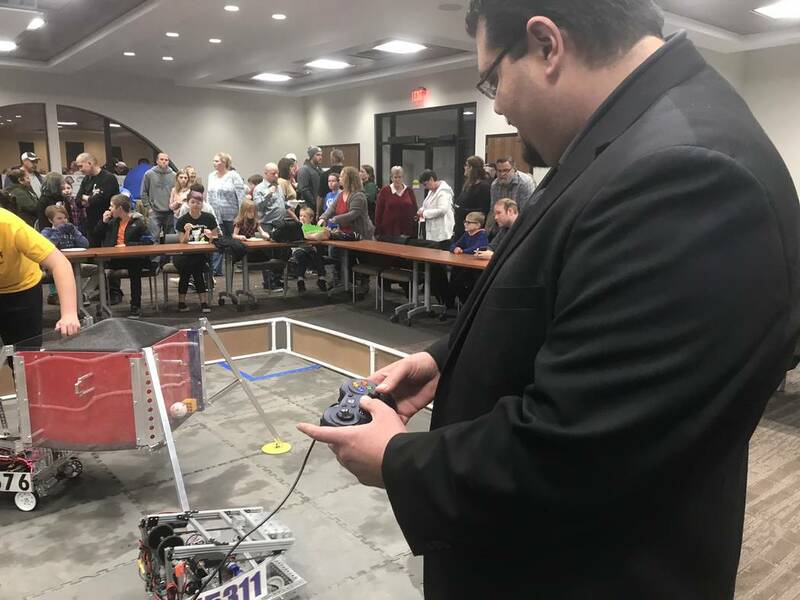 Jeffrey Meehan/Pahrump Valley Times A FIRST (For Inspiration and Recognition of Science and Technology) Tech Challenge (FTC) known as the Circuit Breakers stands at a fundraising event at the Valley Electric Association's conference center in January. The Pahrump Valley High School team is one of three Pahrump area teams heading to the state championships on Saturday in Las Vegas. Jeffrey Meehan/Pahrump Valley Times Robots make the rounds during a meet-play event for the FIRST (For Inspiration and Recognition of Science and Technology) Tech Challenge (FTC) program's 2018-2019 season at NyE Communities Coalition building on Nov. 3. Teams from across the state will compete in a competition on Saturday at Silverdao High School in Las Vegas. Jeffrey Meehan/Pahrump Valley Times Nye County Commissioner Leo Blundo tries out a robot during a fundraising event at Valley Electric Association's convention center. 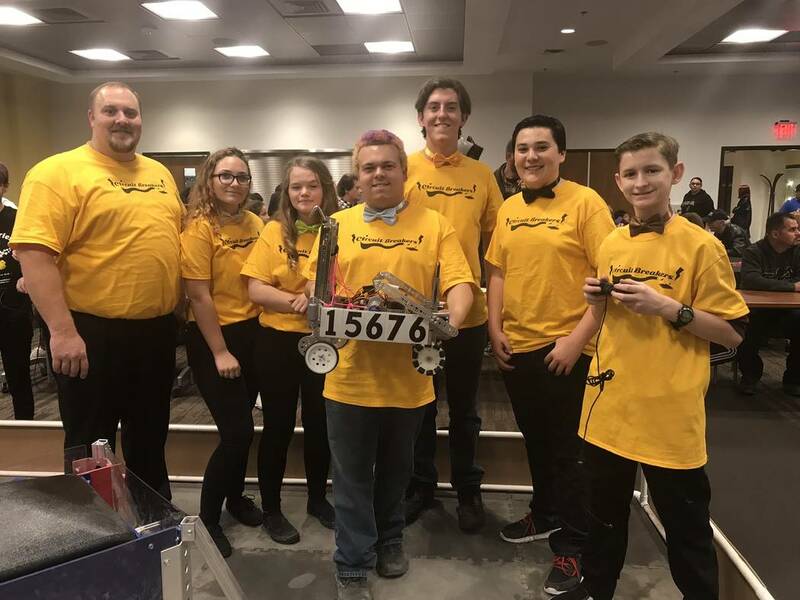 Three teams from the Pahrump area are heading to Las Vegas for the state championships for the FIRST (For Inspiration and Recognition of Science and Technology) Tech Challenge, where teams from across the state battle for first place. The championships will be held starting at 7 a.m. on Saturday at Silverado High School. The event is pegged to end at 4:30 p.m.
Area teams include two from Pahrump Southern Nye County 4-H: The Valkyries, an all-girls team and Awkward Silence. The third team is from Pahrump Valley High School and is known as the Circuit Breakers. In all, more than 30 teams will be at the day-long event that is free to enter and open to the public. The teams contain kids, ages 12-18, who learn how to design, build and program robots, among other things for a statewide program. The program is backed by FIRST (For Inspiration and Recognition of Science and Technology) Nevada, a nonprofit organization. The FIRST organization works to promote its FIRST Robotics programs and STEAM (Science, Technology, Engineering and Math) Initiatives. The organization carries several programs related to those areas, some of which are dependent on age. That includes FIRST LEGO League Jr., FIRST LEGO League, FIRST Tech Challenge and FIRST Robotics Competition. The FIRST Tech Challenge allows kids ages 12-18, though other programs exist for children ages six to 18. In January, a combination fundraiser, demonstration event occurred. The event, sponsored by Pahrump Southern Nye County 4-H, was put on to support all the local teams involved in competitions under FIRST’s group of programs. The event brought in over 200 attendees and raised over $4,000 for future efforts. Nye County Commissioner Leo Blundo even stopped by to test drive a robot, as did Nye County Sheriff Sharon Wehrly. 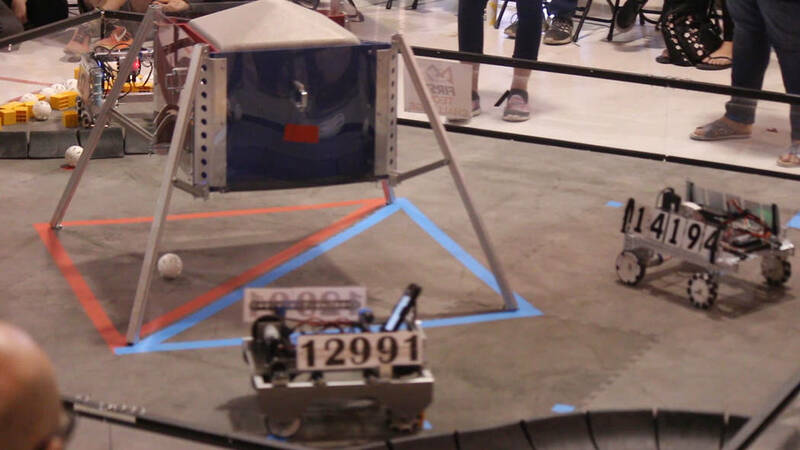 The state championships for the FIRST (For Inspiration and Recognition of Science and Technology) Tech Challenge is scheduled to run from 7 a.m. to 4:30 p.m. on Saturday at Silverado High School in Las Vegas. Three teams from the Pahrump area will be competing in the statewide competition. For more information, head to the firstnevada.org and click on the events tab (then, Statewide Events, FTC).